During the latter part of the 1930s, Company 5407 of the CCC, stationed at Calvin, Louisiana, constructed recreational facilities. One of these, Gum Springs, is located on the Winn Ranger District of the Kisatchie NF. Gum Springs Recreational Area is considered a natural scenic area and continues to be a popular spot for visitors to the forest. This facility was constructed with hard manual labor and included a swimming pool, bathhouses, picnic shelters, walkways, and terraces. Many of these buildings and structures are still in use today. The work performed by the CCC has survived many decades and is very important to the early development of the NFs in Louisiana. We owe a huge debt of gratitude to the CCC, especially in the south (not to mention nationwide) as they did a tremendous amount to bolster states’ economies during the Great Depression of the 1930s. The men of Company 5407 built Gum Springs Recreation Area between 1936 and 1938, using standard FS plans. In May 2003, PIT volunteers David Oper, Izzy Washburn, and Roger Bergstrom joined archaeologists from the Kisatchie NF to build a monument commemorating the CCC’s work at Gum Springs. In preparation for this project, district staff located an outcrop of sandstone of the same type used in construction at Gum Springs. The idea was to make the monument compatible with the buildings and structures remaining at the recreational area. Two large boulders were selected and brought to the site. 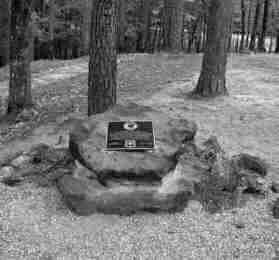 Monument built to commemorate the CCC’s work at Gum Springs Recreation Area, Memorial Monument for CCC Company 5407 PIT project, Kisatchie NF, Louisiana, 2003. We decided to place the monument where visitors would gather when first arriving. This area overlooks the pavilion and what is known as the “swimming pool,” both features built by the CCC. Only the pavilion has been maintained over the years. The pool is not your backyardvariety swimming pool. It has a sandy bottom and is situated in a dammed-up area at the bottom of a ravine where several springs converge. Originally, the area was cleaned out, and the perimeter was lined with local sandstone. Through the years, the sides started to give way, and the FS relined the pool with treated timber. That has also deteriorated, and the dam has given way. A person viewing this area now sees a variety of lush ferns and other herbaceous plants. The FS will soon begin the process of restoring the swimming area to its original condition. Constructing the monument didn’t take five full days to complete, but finding more work that needs to be done is never difficult. Nearby was a prehistoric site that had recently been damaged by looters. FS archaeologists had completed an assessment, but much work was still needed to mitigate the damage to the site. PIT volunteers worked with FS archaeologists to remove the back dirt that the vandals had left in the holes. After the soil was removed, we laid black plastic in the holes, and our part of the work was complete. Since then, FS heritage personnel have screened the back dirt for remaining cultural material and used the screened soil to fill in the vandals’ holes. In the event that further research is conducted in the shelter, the plastic lining serves as a marker between undisturbed ground and the disturbed fill. On Friday, the final day of the project, the CCC monument was dedicated. About 60 CCC alumni from the area attended the dedication and shared many stories about their experiences. After the dedication, all enjoyed a fish fry at the nearby work center.